In partnership with Forshaw Land & Property Group Ltd, Knight Knox International is delighted to unveil its latest buy-to-let offering Clyde House, a beautiful period building on the banks of the River Clyde, which offers investors 9% assured NET yields for the first two years. With only 7,102 university-owned student beds for the whole population of students, demand for accommodation severely outstrips supply. Leading property portal Zoopla named Glasgow as the highest yielding destination for student property in 2013, beating northern rivals Hull and Manchester to the top spot, on the basis of the gross yield achieved by landlords. A boom in student development in recent years has seen a spate of developments take place in student hotspots and, with more than 45,000 students; Glasgow is fast becoming a city that is well worth investing in. Clyde House is a stunning period building facing the River Clyde and is set to be Glasgow’s leading student destination. Containing 90 en-suite studios, there is a choice of three different investment options; Standard, Superior and Deluxe rooms, to allow for varying levels of investment. Neighbouring The People’s Palace and Winter Garden (Glasgow’s largest park) , it is within walking distance of the city centre, which makes this five-storey residence the ideal solution to Glasgow’s shortage of student housing. With only 7,102 university-owned student beds for the whole population of students, demand for accommodation severely outstrips supply. 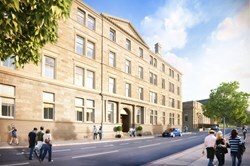 Created by Forshaw Land & Property Group ltd, the developer behind lucrative projects such as St. Ann’s Lodge and Nelson Square, students living at Clyde House will have access to a multitude of communal facilities such as a communal lounge, games rooms, a fully equipped gymnasium, secure bicycle storage and a laundry room. Additionally, there will be an on-site management office which will be operated by PRIMO Property Management Staff, who will manage and let the building. PRIMO Property Management Staff achieved the ‘Highly Commended’ runner up status in the ‘Start up Business of the Year category of the Bolton & Bury Business Awards 2013. Working closely with the developers Forshaw Group in the past, PRIMO have been able to foster strong grounds which will enrich the student residential experience and provide investors with confidence in high returns over the long-term. Clyde House follows on from the highly successful launches of Greenbank Court, Plymouth and Halley House in Nottingham and is the 10th project to be launched by Knight Knox International in conjunction with Forshaw Group. Previous projects such as St. Ann’s Lodge, Nelson Square and Lovell Park all have 100% occupancy for the 2013/14 academic year. The development is due to be completed for the September 2014 intake. Student rooms on the banks of the River Clyde start from £57,500 and investors are assured 9% NET yields for the first two years. For further details about investing in Clyde House, contact Knight Knox International directly on +44 (0)161 772 1370 or visit the website.